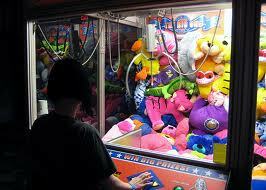 Claw machine - the prefect crime? You think you've seen it all and then something like this comes along. This video YouTube video shows a woman desparately trying to get her child out of an arcade claw game machine at the Sainsbury's supermarket in Belfast City. The description of the video says "A lady is seen pushing her child up the prize drawer of a machine for the money attached to the prizes." Who knows?! Whether it was attempted robbery or that the child was just an over enthusiastic claw machine player this is definitely a contender for the list of Ireland's dumbest criminals.